The world’s most expensive chopper at a whopping $22.7 million would annoy any chopper lover for this sort of insane price tag on it, however, for the delight of any adventure lover, the price tag also includes a 45-meter luxury transoceanic yacht. Coming from the House of Thunder (German custom bike builders) in collaboration with Turkey-based Yacht manufacturer Sunrise Yachts, this incredible 45-meter yacht with a rear garage houses a rescue boat, two jet skis and a custom Harley-Davidson, built and painted to match the boat’s livery. 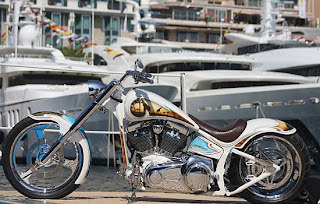 The chopper based on a stock Harley Rocker with a cleaned-up frame, hand-fashioned fenders and fuel tank also features a foldable handlebar allowing the bike to be lifted in and out of “parking position” in the small garage in the rear of the boat. Phew, it was so relieving to let you guys know what exactly the world’s most expensive chopper has in it.